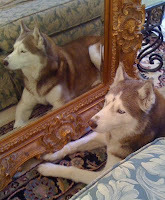 Today, October 11, is the 1 year passing since Tessie died from hemangiosarcoma. I was so devastated a year ago especially because of all that happened during the last week of her life. Since then many clients have come to me with dogs that have hemangiosarcoma and I always feel an especially deep bond with them as this is such an aggressive, insidious form of cancer. Tessie had such a tragic life as an abused puppy mill dog and it makes me so sad to know this was what took her down. Tessie had been thrown over a 6 foot fence into the Santa Maria Shelter. She was transported with another dog to Ariel Rescue. I fostered her initially following the death of my beloved Ariel. She had a lot of emotional and aggression issues so it wasn't easy to bond with her. But over time, she became my "copilot" and went everywhere with me. She taught me so much about life and how finding peace. Her greatest joy was sitting out back under the palm tree and cruising through the many bushes and woods by our home. Two days before she died, she was so sick with fluid in her belly (ascites fluid) and fluid had collected around her heart. Still, she marched triumphantly to the top of a wooded hill to say one last goodbye to her playground. She was such a loyal friend and so brave. We had to have her abdomen drained several times because of the ascites. She went through so much at the end and I am happy to say that on her very last day, she ate for me, took a beautiful walk and then within hours we lost our beautiful girl. Tessie, we will love you forever and miss you everyday. Thank you for coming into our lives--we will never forget you! Our hearts go out to you, these anniversaries are so ruff. Tessie was a special, lucky girl to have you, and you are an awesome human for not giving up on her. The universe is a better place because of you both. We lost our Jerry to osteosarcoma on October 3, 2008. The pain of losing him sometimes seems as raw as it did on that day. But we go on, and we play and smile, because we know it's the dog thing to do.